"Merry Christmas and Happy Holidays from the Wastes of Cania!" Q: Have you ever played the mobile phone versions of Baldur's Gate or Neverwinter Nights? Considering the results of this poll it's pretty clear that practically no one here (apart from the 3% of exceptions to the rule) has played the mobile version of either Baldur's Gate or Neverwinter Nights. Throughout this poll's run I've been getting blank stares from people who've never heard of the mobile versions, so let me point out that we've posted a few news articles on both of the games, so you can search our news archives for Baldur's Gate or Neverwinter Nights Mobile if you are interested in more information. Here are also the links to official sites for both: Baldur's Gate Mobile and Neverwinter Nights Mobile. Q: Of the (A)D&D computer games & expansions THAT YOU OWN, how many are legal copies? A bit more than two thirds of poll participants (68%) voted that all of the (A)D&D games & expansions that they own are legal copies. The second largest group of votes, 12%, was cast by the people who voted that nearly all of the (A)D&D games & expansions that they own are legal copies. The third largest group of people who voted, 8%, have no legal copies of any (A)D&D games & expansions that they own. The remaining 11% of votes went to having around 1/2 legal copies (4%), then around 3/4 (3%), followed by 1/4 (2%) and the last 2% going to having hardly any legal copies of (A)D&D games & expansions. Q: How many of Peter Jackson's The Lord of the Rings movies (either theatrical or extended editions) have you seen? A huge number of our visitors who participated in the poll (92%) have seen all three of Jackson's The Lord of the Rings movies, either the theatrical or extended editions (or both). 4% of those who voted have seen only two of the movies, 3% have seen only one movie, and, finally, only 2% of those who participated in the poll haven't seen any of Jackson's The Lord of the Rings movies. Q: Do you register the games you buy? The majority of poll participants (39%) never register the games they buy, followed by 27% of people who rarely register them. 22% of those who voted sometimes register the games they buy, and finally 12% of the people who voted always register the games they buy. Q: Do you think dragons are overused in fantasy computer games? A clear half of the poll participants (50%) do not think that dragons are at all overused in fantasy computer games. On the other hand, 29% of those who voted think that dragons definitely are overused in fantasy computer games. The remaining 21% of the poll participants voted that dragons might be overused, but that they are not certain if it is so. Q: Have you read The Lord of the Rings by J. R. R. Tolkien? Practically half of the poll participants (49%) have read Tolkien's The Lord of the Rings 1-3 times. A whopping 17% have read the book(s) 10 times or more! 12% of those who voted have read it 4-6 times. Only 10% of the people who participated in the poll haven't read The Lord of the Rings yet (but intend to at some point). Another 7% also have not read it yet, but they never intend to either. Lastly, 5% of those who voted read it 7-9 times. Q: Which of the games (expansions included) covered on SP did you (re)play last? First of all, thanks to Arabwel for this really good poll idea, which has proven quite popular with the SP visitors. The fact that the majority of those who voted (35%) (re)played Baldur's Gate 2 and/or its expansion last doesn't really come as a surprise, though the game's longevity continues to amaze me. When oh when, if ever, are we going to get another D&D CRPG with so much detail and gameplay right out of the box? A somewhat more distant second is Neverwinter Nights and/or its expansions, (re)played last by 23% of poll participants. Icewind Dale 2 is still reasonably popular, and has been (re)played last by 12% of the people who voted in our poll. 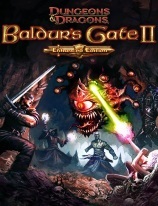 The original Baldur's Gate and/or its expansion is not that popular any more, but taking into account that its release was 7 years ago (lordy, lordy, I'm feeling old), it is still holding on marvelously, considering 8% of those who voted (re)played it last. Another 8% of votes had been cast in favour of Planescape: Torment, an excellent CRPG whose kind we are not likely to see again anytime soon. The Temple of Elemental Evil, a relatively recent release, isn't doing all that well, considering only another 8% of those who voted (re)played it last. Near the end of the list is the original Icewind Dale and/or its expansions, (re)played last by 4% of poll participants. The losers of this poll are Forgotten Realms: Demon Stone (the most recently released D&D game) and Pool of Radiance: Ruins of Myth Drannor, each with 1% of votes. Q: On a scale of 1 to 5, how would you rate the expired year 2004? We can sum up this poll by saying that the majority of poll participants (clear 33%) consider 2004 an OK year, that 34% consider it a (pretty) bad year (ratings 1 & 2 combined), and that another 33% (ratings 4 & 5 combined) consider it a (pretty) successful year. I love it when seemingly random numbers come together to form such a nice arrangement. Overall, people have voted 2003 to be a somewhat mediocre year. The majority (40%), rated it 3/5. 29% of poll participants were a bit happier with it, rating it 4/5. 16% rated it 2/5, a pretty bad score, beaten by the 9% of those who voted the year 2003 1/5. 6% of those who voted, however, were so happy with 2003, that they rated it 5/5. Q: Did you get any PC games for Christmas, or expect to get them for New Year? Curiously enough, the majority of poll participants (60%) did not get any PC games as gifts for Christmas or New Year. 26%, however, did get one or more games, with CRPGs among them. Another 12% of those who voted also got some PC games, but not any CRPGs. At the time of voting, only 3% of those who participated in the poll were not sure if they got/will get any PC games for Christmas or New Year. Q: What kind of personal computer do you play games on? Most of the poll participants (81%) play games on a desktop personal computer. A much smaller number, 12%, play games on both desktops and laptops. 7% of those who voted play games only on a laptop. Finally, a whole percent of the people who voted don't play any computer games at all. Q: Have you played BioWare's "Witch's Wake" Neverwinter Nights module? The majority of poll participants (53%) haven't played the original, free version of Witch's Wake Neverwinter Nights module, nor the remastered, "premium" version BioWare is now selling through their online store. However, quite a large number of people who voted in this poll (41%) have played the original, free version of Witch's Wake. The remaining 4% of those who voted have played only the remastered, "premium" version of Witch's Wake, and the final 3% of participants in the poll have played both the original, free version, and the "premium" version of Witch's Wake. Considering we ran this poll only a couple of weeks after the "premium" version became available, the odds certainly seem favourable for BioWare that they will make a profit with the "premium" modules. Q: Which play aspect in a CRPG is the most important to you? Not surprisingly, single-player is the most important play aspect in a CRPG to the wide majority our visitors (73%) who voted in the poll. To 17% of those who voted in our poll, the most important play aspect in a CRPG depends on what the game is like. Only 7% of poll participants think that single and multi-player are equally important in a CRPG. Finally, a mere 3% of those who voted consider multi-player to be the most important play aspect in a CRPG. Q: What kind of graphics card do you have in your gaming machine? More than half of our visitors who voted in the poll (52%) use a graphics card by Nvidia for gaming. ATI is trailing somewhat behind Nvidia, with 39% of poll participants having one of their graphics cards in their gaming rig. 5% of those who voted don't know what kind of graphics card they use, 3% use (older) graphics cards by other makers, and the remaining 2% use whatever graphics card or chip their motherboard came equipped with. Q: How many NPCs do you usually take into your party in Baldur's Gate 2? The wide majority of poll participants (70%) usually make a full party, taking 5 NPCs into their group when playing Baldur's Gate 2. Surprisingly, 13% of the people who voted in the poll don't take any NPCs into their party in Baldur's Gate 2. The remaining options of 1-4 NPCs in the party are much less popular. 8% of those who voted in the poll take 4 NPCs, 5% take 3, and 2% take 2, and another 2% take 1 NPC into their party in Baldur's Gate 2. Q: What are your feelings towards the kobold henchman Deekin (SoU, HotU)? Almost half of the poll participants (49%) feel that the kobold henchman Deekin from Shadows of Undrentide and Hordes of the Underdark is very amusing, and love him. 17% of those who voted still think that Deekin is ok, but don't think that there is anything particularly special about him. On the other hand, 13% of our visitors who voted in the poll can't stand Deekin and consider him highly annoying. 11% of votes were contributed by people who have no feelings whatsoever for Deekin, so presumably neither good nor bad ones. Lastly, 10% of the people who participated in the poll consider Deekin to be somewhat irritating. Q: Which of the following games & expansions do you own? Nearly two thirds of the people who voted (64%) own the original Neverwinter Nights, as well as both expansions. 12% of the poll participants own Neverwinter Nights only, while another 12% don't own any Neverwinter Nights games whatsoever. 8% of those who voted own Neverwinter Nights and Shadows of Undrentide. The remaining 4% of the people who voted in our poll own Neverwinter Nights and Hordes of the Underdark. Q: Are you going to buy any of BioWare's premium Neverwinter Nights modules? A third of the people who voted in the poll (33%) answered that they will not buy any of BioWare's new premium Neverwinter Nights modules. A quarter of poll participants (25%) may buy some of them, but only after they read or hear some opinions on the modules. On the other hand, 18% of our visitors who voted in the poll are definitely going to buy some of the premium modules. 14% of those who voted say that they would buy them, but don't have a credit card, so no means of paying for the modules. Finally, 9% of the people who voted are so bothered with the idea of online verification of the legality of the modules every time they wanted to play them, that this prevents them from buying the modules they otherwise would. The majority of our visitors who voted in the poll (40%) haven't played any of the AD&D CRPGs released before the original Baldur's Gate. 37% of those who voted, however, have played many of these early AD&D CRPGs. Lastly, 23% of poll participants have played either only a few of the early AD&D CRPGs, or just one. Q: Are you going to dress up for Halloween? The majority of poll participants (57%) voted that they will definitely not dress up for Halloween. On the other hand, 26% of those who voted definitely will dress up for the occasion. Finally, at the time of voting, 17% of our visitors who voted in the poll haven't decided whether they will dress up for Halloween or not. Q: Which D&D ruleset used in CRPGs from Baldur's Gate onwards do you prefer? Apparently, the majority of poll participants (60%) have readily accepted the 3rd/3.5 edition of D&D as their preferred ruleset in D&D CRPGs. However, 2nd edition D&D (AD&D) is still the preferred ruleset of 32% of those who voted in the poll. Only 8% of our visitors who voted in the poll have no preference when it comes to the D&D ruleset used in D&D CRPGs. Q: If prices on new PC games get raised up to $60, would you still buy games before their price drops? The majority of poll participants (36%) already don't buy games at full price, so any price increase would make their buying even less likely. 32% of those who voted would wait for the price to drop before buying, if PC game prices got raised up to $60. 29% of participants in the poll would still buy PC games with a price tag of $60, but only specific titles. Finally, only 2% of all who voted would definitely still buy PC games at $60, even before their price drops. Q: Are you interested in beta testing Dragonshard, the upcoming D&D real-time strategy? More than half of the poll participants (58%) voted that they are very interested in beta testing Dragonshard. 27% of those who voted, on other hand, are not at all interesting in the beta test. The remaining 15% of people who voted are not particularly interested in beta testing Dragonshard, but might try to apply anyway. Q: How do you prefer to view fan-made game walkthroughs? The majority of poll participants (30%) prefer to view fan-made game walkthroughs downloaded on their computers. Only a few people less (27%) have no preference, and are satisfied either with online or downloadable walkthroughs. A quarter of those who voted (25%), however, prefer to view walkthroughs online. Those who like to print out fan-made game walkthroughs (12%) are in the minority. Only 6% of all poll participants voted that they never use any fan-made game walkthroughs. Q: Are you interested in playing Forgotten Realms: Demon Stone? Nearly half of the poll participants (49%) voted that they are interested in playing Forgotten Realms: Demon Stone. 32%, on the other hand, are waiting to read some reviews before they will make up their minds. 19% of those who voted are not interested in playing Demon Stone at all. Q: Do you think Baldur's Gate 3 could ever come near the quality of the original Baldur's Gate titles, since it will be done in 3D? Some relevant comments & explanations on this poll were made here, so please read that for more information. The majority of poll participants (58%) allow for the possibility of Baldur's Gate 3 coming near the quality of the original Baldur's Gate titles, despite being made in 3D. 23% of those who voted are more skeptical, however, and are doubtful about Baldur's Gate 3 being on par with the original titles. This vote was based on personal experience with CRPGs in 3D. The last 20% of people who voted have absolutely no faith in a 3D Baldur's Gate 3, voting that it could never match the quality of the previous Baldur's Gate titles. Q: How often do you read any of the forum news posted on Sorcerer's Place? The majority of poll participants (29%) occasionally read some or all of the forum news we post. Almost as many (26%), however, read the forum news every day. 19% of those who voted read the forum news every couple of days. Finally, 14% of those who participated in the poll rarely read the forum news we post, and another 12% never read it at all. Q: If any of the upcoming D&D CRPGs had an optional gay romance, would it bother you? The wide majority of participants in the poll (41%) voted that an optional gay romance in any of the upcoming D&D CRPGs would not bother them, provided it is really completely optional. On the other hand, 28% of those who voted are bothered by the sheer idea of a gay romance in a D&D CRPG. For yet another different angle, 22% of the people who voted would actually welcome a gay romance. Lastly, 9% of poll participants were not sure whether a gay romance in D&D CRPGs would bother them, and would rather reserve judgment until they actually see how it is implemented. Q: Does it bother you that Neverwinter Nights 2 will start with characters at level 1 again? The wide majority of poll participants (67%) are not at all bothered that Neverwinter Nights 2 will start with characters at level 1 again. 17% of those who voted, however, are somewhat bothered. Finally, 16% of the people who voted are very much bothered by the fact that Neverwinter Nights 2 will start with characters at level 1 again. Q: How important is the D&D licence to you in the CRPGs you play? The majority of people who voted in the poll (43%) said that the D&D licence in CRPGs they play is quite important to them, as they mostly play D&D CRPGs, but not exclusively. Only 1% of people less (42%) voted that the D&D licence is not that important to them, as they play both D&D and non-D&D CRPGs. Lastly, 15% of poll participants voted that the D&D licence in CRPGs is very important to them, since they only play D&D CRPGs. Q: How do you like the new Sorcerer's Place design? 24% of those who voted think that the new design is "ok", while another 14% voted that they liked the old one better. Q: Which of the upcoming D&D games are you looking forward to the most? Hardly surprisingly, the overwhelming majority of poll participants (77%) are looking forward to the next Baldur's Gate the most. Since no details on who is making Baldur's Gate 3 are known at this point (apart from the fact that it is being made), we can only guess what the outcome will be like. One thing is certain, however - the expectations are very high. Another game still shrouded in mystery, the sequel to Neverwinter Nights is being much less eagerly anticipated among our visitors who voted in the poll. Only 16% voted that they are looking forward to Neverwinter Nights 2 the most. Dungeons & Dragons Online, the D&D MMORPG, is being most eagerly anticipated by 5% of the people who voted. The upcoming D&D title people are least looking forward to (only 3% of the votes) is the D&D RTS, which has been renamed to Dragonshard Wars earlier this week. It'll be interesting to see what the fate of this Eberron-based RTS will be. Q: Do you buy paperback or hardcover books? Almost half of the poll participants (49%) voted that their buying either a paperback or hardcover edition depends on the book itself. 27%, however, voted that they always buy paperbacks when available. On the other hand, another 20% voted that they always buy hardcover editions when available. Lastly, 4% of those who voted claim that they don't buy any books at all. Q: Have you ever accidentally physically damaged (cracked, scratched etc.) any game CDs so severely that they became unusable? Nearly half of the people who voted (48%) have already accidentally physically damaged one or more game CDs so that they became unusable. On the other hand, 35% of poll participants have never so severely damaged any game CDs. 9% of those who voted are quite clumsy when it comes to handling CDs, and have voted that they have accidentally physically damaged game CDs many times. Finally, 7% of participants in the poll are not sure or don't remember if they ever have. Q: On how many online message boards do you post regularly? A full quarter (25%) of those who voted post regularly on one message board. Almost as many of the participants in the poll (24%) post regularly on 2 message boards. 10% of those who voted regularly post on 3 message boards, followed by 4% of those who regularly post on 4. Another 4% of poll participants regularly post on more than 5 message boards, followed by 2% of those who regularly post on 5. Q: Do you think Interplay is going to survive and avoid bankruptcy? The majority of poll participants (45%) voted either that Interplay might have a chance at survival, or that they don't know if it does. 43% of those who voted, however, believe that Interplay is never going to survive and avoid bankruptcy. Only 12% of the people who voted are optimists, voting that Interplay will definitely survive. Q: Do you play at least occasionally in any of the Neverwinter Nights multiplayer/persistent worlds? The vast majority of poll participants (74%) voted that they do not play in any of the Neverwinter Nights multiplayer/persistent worlds, even occasionally. The remaining 26%, however, do play in some, at least occasionally. Q: Are you interested in reading or have already read any of the mod reviews posted on our message boards? Although the number of people who voted in the poll is quite small, of those that did, the majority (70%) voted that they are interested in reading or have already read some of the mod reviews posted on SP. On the other hand, 30% of poll participants voted that they are not interested in reading the reviews. Q: Do you think coverage of the upcoming Dragon Age, the first non-D&D game on Sorcerer's Place, is a good idea? Obviously there are not that many conservative D&D-only gamers around SP, since the majority of poll participants (55%) have voted in favour of covering the upcoming Dragon Age on Sorcerer's Place. 28% of those who voted are still undecided at this point whether covering Dragon Age is a good idea or not. Only 17% of the people who voted think that SP should stick to only D&D games. Q: Are you interested in any console or non-D&D games BioWare is currently making? The poll results don't really require any commentary, so I'll just mention again, in case you haven't heard yet, that we've started coverage of BioWare's non-D&D game Dragon Age a few days ago. For now, you can keep current with the news about the game on the front page, as well as join the discussion in our Dragon Age forum. Q: On a scale of 1 to 5, how interested are you in the recently announced real-time strategy D&D game set in Wizards of the Coast's new Eberron setting? Most of the people who voted (23%), are not really interested in the recently announced D&D RTS set in the new Eberron setting, rating their interest 1/5. However, 22% of those who voted are reasonably interested in it, their interest being 3/5. Closely behind are those who are most interested in this new title (20%), with interest rated 5/5. Also quite interested are those who rated their interest 4/5, namely 18% of poll participants. Finally, 17% of those who voted in the poll rated their interest 2/5. Q: Have you completed all of the D&D games and expansions you own at least once? Quite a large majority of poll participants (42%) have completed all of the D&D games and expansions they own at least once. A few less (39%), haven't completed them all yet, but are working on it. Only 19% of those who voted haven't completed all of the D&D games and expansions they own, and also probably never will. Q: What do you look for in fantasy multiplayer CRPGs the most? The poll results pretty much speak for themselves in this poll, so extensive comments are really not necessary. The interesting things to note are that the majority of poll participants do not play fantasy CRPGs in multiplayer at all. The rest who do, however, seem to be most interested in the game's story, player co-operation, and quests.